Uddiyana bandha takes the energy from mula bandha and draws it up the spine into the thorax. To better understand this bandha, it is helpful to review the abdominals and the thoracic diaphragm. Let’s begin by warming the relationship of the abdominals and the breath. Come to rest on your back and place your hands on your belly. As you inhale, feel how the belly softly rises into your hands. And as you exhale, feel how it falls. This is the belly breath. After a few rounds of the belly breath, begin to actively engage the abdominals in towards your spine as you exhale by using the transverse abdominus, that muscle that wraps around your midsection like a corset. This should allow you to squeeze out any last bit of breath. As you inhale, release the abdominals and allow the belly breath. Continue a few rounds like this and then rest. If you are new to the practice, stop there and practice that much for a few days. When you are ready, you’ll move to the next phase. Continue as before. Inhale, allow the belly to rise. Exhale, engage the abdominals to squeeze the breath out. Then hold the breath out while you lift both the pelvic diaphragm, engaging mula bandha, and the thoracic diaphragm. This is uddiyana bandha. Slowly release and allow yourself a couple of natural easy breaths before repeating. After a few rounds, stop there and resume the practice another day. As with any of these practices, they can be strong muscular actions or more energetic. After you have practiced as above for a period of time, start to take the practice into sitting. Find a comfortable sitting position. As you inhale, feel the length of your spine. As you exhale, allow your spine to round into a C-curve position using the abdominals to squeeze the last bit of breath out. Inhale, and sit tall again. On your next round, begin your C-curve from a lift of the mula bandha, but continue to engage the abdominals to squeeze the air out. Inhale, sit tall and breath normally again. On your next exhale, repeat the rounding of the spine while engaging mula bandha and the abdominals. Hold the breath out and add your uddiyana bandha, with a lift and hollowing of the belly up into the diaphragm. 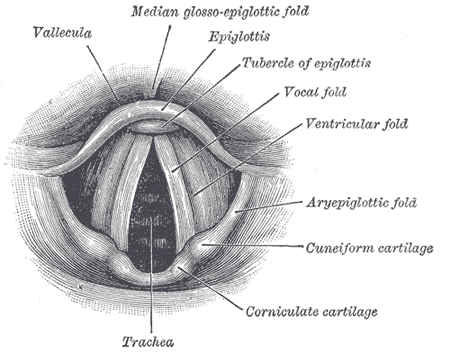 Notice the closing of the glottis. Release the glottis and the diaphragm as you sit tall and allow the breath to flow in. Breathe normally for a few rounds, and repeat. With this practice, less is more. Practice over time to reap the benefits. Begin to notice places in your everyday life and daily practice where you find a spontaneous engagement of the bandhas. Play with it in cat pose, downdog, inversions, arm balances, and more. Feel free to share your findings here. The thoracic diaphragm is the main breathing muscle of the body. It is a double doming structure that divides the thoracic cavity from the abdominal cavity. It attaches to the lower circumference of the ribcage. And its fibers run from out to in like the spokes of a wheel to attach to the central tendon in the middle of the body just forward of the spine. 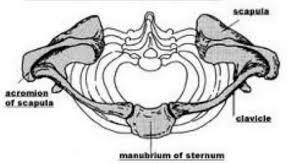 The diaphragm also has two long kite tails called crura that run along the front of the bodies of the vertebrae. 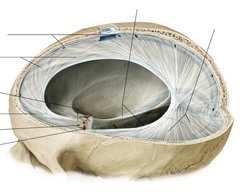 While most anatomists state that the crura go to T12, Bonnie Bainbridge Cohen believes that the fibers actually go all the way down to the tip of the coccyx offering support to the front of the spine. Her argument is that sitting in chairs allows the lower part of the muscle to atrophy among those of us in the west. Regardless of whether the muscle goes to the tail or not, the fibers interdigitate with those of the anterior longitudinal ligament and there has been increasing research to suggest a contractile component to the function of connective tissue. So it is not unreasonable to suggest that the contractile support of the crura of the diaphragm can be felt to support the spine all the way to the tail. During breathing, the fibers of the diaphragm contract to pull the central tendon down an inch or two (though the felt sense is much bigger). This action changes the pressure in the two cavities. It creates a negative pressure in the lungs by increasing the lung volume, allowing air to rush into the lungs. The abdominal cavity is a closed fluid system. As the diaphragm draws down, it displaces the belly organs slightly down into the pelvis and out into the belly. This is the action known as the ‘belly breath’ in yoga. This can be felt in nearly any pose, but especially in a reclining pose where the abdominal muscles are not needed to support the spine. 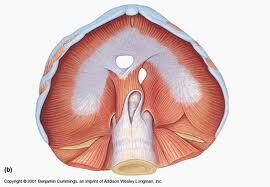 There are many cool things about the thoracic diaphragm. One of them is that the fascia that surrounds the top of the diaphragm interdigitates with the fascia that comprises the pericardium, the sack that surrounds the heart. So that as we breathe, the heart is softly rocked and cradled by the breath. The fascia on the lower part of the diaphragm is continuous with the fascia of the peritoneal cavity which contains most of the abdominal organs. All of our organs are massaged by the movement of the breath – one of the benefits of pranayama practice. 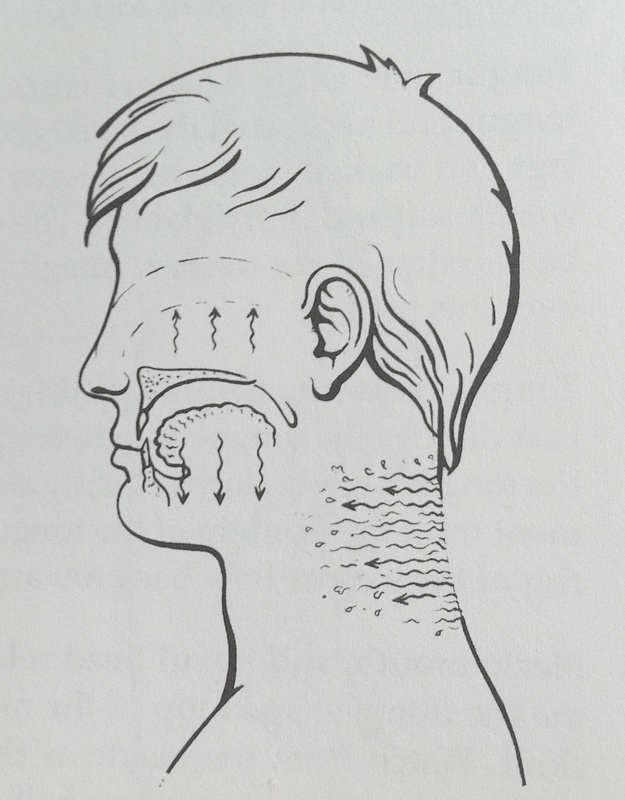 Another very cool thing that I recently learned about the diaphragm from anatomist Dr. Willard at an osteopathic conference has to do with its role in the immune system. Occasionally, the abdominal cavity becomes congested with excess fluid. 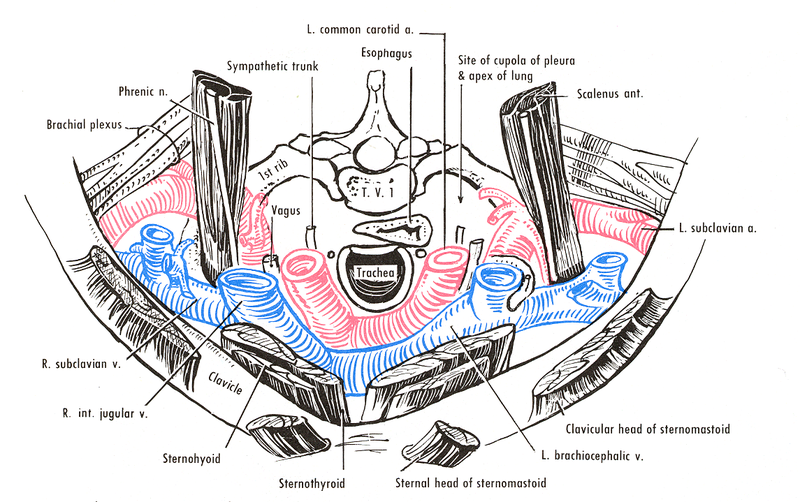 Both the lower and upper surfaces of the diaphragm have pore-like structures called stromata, but the lower half has more. And within the structure of the diaphragm is a network of lymphatic vessels that lead from the stromata to the cysterna chyli, the main lymph channel. What does this mean? It means that the thoracic diaphragm pumps fluid from the abdominal cavity and returns it to the lymph. For yogis, this gives us another reason to do two things.. our pranayama practice and inversions, as inversions use gravity to bring fluid closer to the diaphragm. These can be active or passive. Two of my favorite restorative inversions are legs up the wall (with pelvis higher than head) and extended bridge. Sometimes it feels that the thoracic diaphragm is locked down. 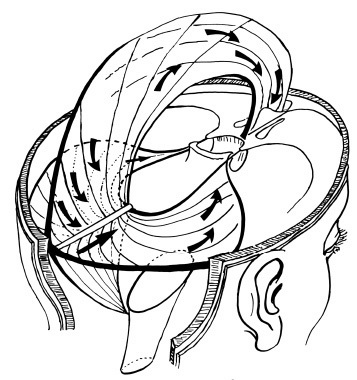 One technique for releasing the diaphragm is to add a little bit of compression. Lying in sivasana with a 5-10 pound sandbag resting on the base of the ribcage is one option. The other option is crocodile pose. For crocodile, come onto your belly with the legs as wide as your mat, toes turned outwards. Stack the forearms on top of each other so that you touch your elbows with your fingers and rest your head on your arms. This will put a little more weight on the base of your ribcage. Both of these positions require the diaphragm to work a little bit harder against the weight, but it does so without strain. After 5-15 minutes, remove the sandbag or release your crocodile pose and notice the change in your breath and the fullness of the movement of the diaphragm. Many pranayama practices also tone the diaphragm, but we’ll save those for another day.